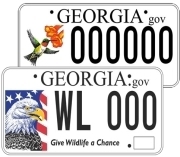 Georgia’s State Wildlife Action Plan needs you. Created in 2005 by more than 100 conservation partners and stakeholders, this strategy to conserve and restore native wildlife species and habitats statewide has been revised, as required by law. Your comments can help shape the draft of the revised plan. The new SWAP will guide efforts for the next decade that benefit scores of species and habitats, from golden-winged warblers to longleaf pine savannas. Public feedback helps ensure that the wildlife and wild places millions of Georgians enjoy is conserved now and for future generations. Review the plan and comment online by July 15 or at one of the following public meetings. Sea turtle nesting is off to a fast start and could be bound for a stellar season, if not a state record. The Georgia Sea Turtle Cooperative counted 1,068 loggerhead nests as of Wednesday, just shy of last year's season total, 1,201. DNR Sea Turtle Program Coordinator Mark Dodd wrote last week that totals through June 7 were the most since comprehensive nest surveys began in Georgia, some 26 years ago. Dodd notes that May totals are "highly variable" and not a solid predictor of final nest counts for these federally threatened sea turtles. For example, 2013 had 370 nests through June 7 but ended up with the most nests on record in Georgia. Biologists were expecting a big year in part because about 75 percent of the loggerheads that nested in 2011 -- a strong year -- and were identified through genetic profiling by UGA and DNR had not nested in Georgia since that summer. Sexually mature females usually nest every two to four years, returning to the vicinity of beaches where they hatched. Translation: Many Georgia turtles were due. 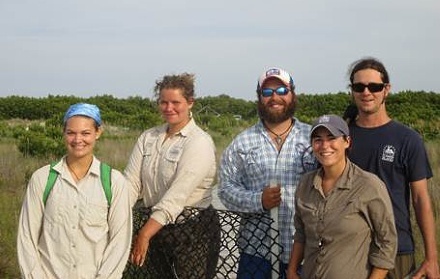 Follow nesting updates from the Georgia Sea Turtle Cooperative. Some leatherback sea turtle crawls have been reported, including at Wassaw and Tybee islands. (video of the Tybee turtle). Two green sea turtle nests have been confirmed, and more are expected in light of strong nesting by the species in Florida. Strandings in Georgia were slightly below average this spring, with 63 stranded turtles through May. The average is 70. About 18 percent of the stranded turtles had boat collision injuries and 25 percent were presumed fishery mortalities. The shrimp season opened in state territorial waters this week. DNR rangers are checking trawlers to make sure turtle excluder devices (TED) are used according to regulations. 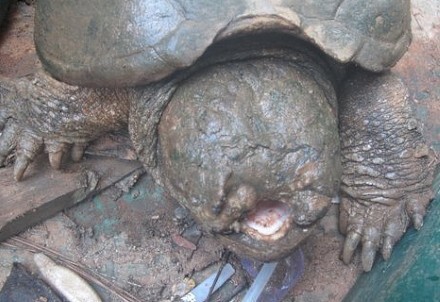 A common snapping turtle found recently in middle Georgia's Monroe County is anything but common. DNR wildlife technician Ashley Harrington was surprised when neighbors Steve and Janice Hicks brought him the turtle, which their son Steven caught in a creek. If the snapper had eyes, Harrington couldn’t see them. And most of the reptile’s hooked upper jaw, or mandible, was missing. Whether the snapper’s condition resulted from injury or birth deformity is a mystery. If by injury, it likely wasn’t a recent one. The turtle also looked healthy (and, yes, it tried to bite them when they moved it). DNR senior wildlife biologist John Jensen said that while determining the age of mature turtles is difficult, judging from photographs this one is at least 20 years old. Jensen and other experts contacted about the turtle agreed that it apparently can catch and eat food. They recommended returning the hard-shelled survivor to the creek, which the Hicks did. With each passing day, we are moving closer to the peak of the hummingbird season, that special time of year when squadrons of hummers invade our backyards, vying for the opportunity to feed on nectar from our flowers and feeders. 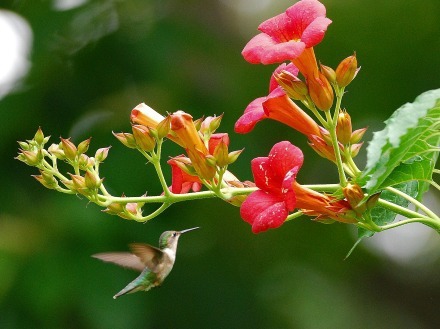 It is only natural, then, that hummingbird enthusiasts are paying more attention to which plants make their yards more inviting to these winged dynamos. A quick look at what's available at local and online nurseries reveals a number of plants that bear the name hummingbird. Read Terry’s column sounding praise for trumpet creeper, plus a few cautions! Gopher tortoise restoration at Yuchi Wildlife Management Area has a leg up after 153 head-started juvenile tortoises were added to the WMA near Waynesboro this month – the state’s largest release ever. 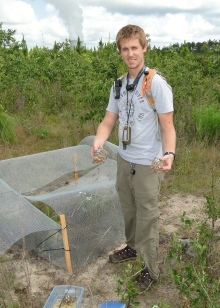 UGA graduate student Dan Quinn of the Savannah River Ecology Laboratory helped raise the tortoises, supervised their release into wire-mesh pens and will monitor how they fare after the pens are removed in early July. Eight of 12 tortoises released in 2014, the project’s start, survived at least one year. Head-start tortoises receive better food and care, hopefully leading to higher survival rates. At one year, these turtles are the size of 2- to 3-year-olds in the wild and less vulnerable to predators. Study how effective head-starting is for rebuilding tortoise populations, using eggs collected from stable populations. 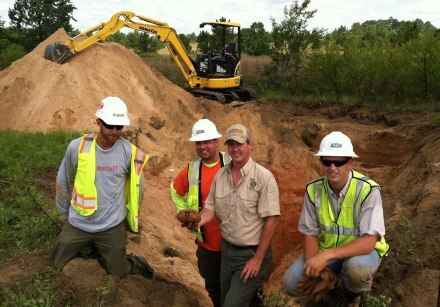 Rebuild Yuchi’s population from an estimated 88 gopher tortoises to a minimum of 250 adults, considered a threshold for a long-term, sustainable population. The study involves UGA’s Savannah River Ecology Laboratory, DNR’s Nongame Conservation Section, St. Catherines Island and Reed Bingham State Park. Five manatees fitted with satellite transmitters this month are already showing the potential of new research aimed at better understanding how these endangered mammals use the murky estuarine waters near Naval Submarine Base Kings Bay and along the rest of Georgia’s coast. While some of the manatees have stayed in Cumberland Sound, one swam south and another as far north as St. Simons Island. On Monday morning, four were in Camden County; the fifth was near Mayport, Fla. The manatees, the first tagged in Georgia with GPS tracking devices, mark the start of a multi-year project to document manatee activity near the sub base, map migratory paths and habitat use along the Southeastern coast, and provide baseline data to help assess manatee health. Findings can be used to conserve manatees, which migrate each spring from Florida and face significant risks from boat strikes. 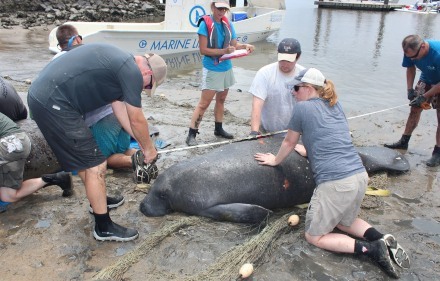 The project is also revealing the public’s care and curiosity concerning manatees. Some people who mistakenly thought tagged animals were entangled in crab-pot buoy lines have called DNR. 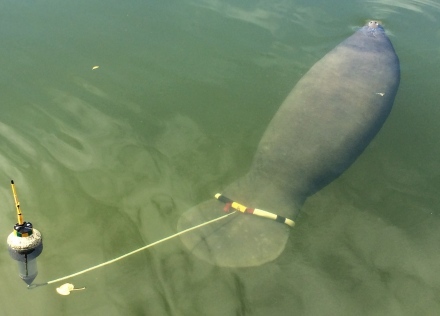 The transmitter, tethered to a belt around the tail, floats at the surface behind each manatee (video). But the devices do not harm the animal and are designed to break free if entangled, said research scientist Monica Ross of Sea to Shore Alliance. Project partners also include Naval Submarine Base Kings Bay, DNR, Georgia Aquarium and others. Call DNR at 1-800-2-SAVE-ME (800-272-8363). Note the time, date, location, tag color and whether other manatees are present. Do not chase, touch or otherwise harass the manatee, or touch the tag. Manatees are protected by federal and state law. Feathers are flying over U.S. Rep. Jeff Duncan’s spending bill amendment that critics say would restrict the federal government from prosecuting violators of the Migratory Bird Treaty Act. According to Duncan’s staff, the South Carolina Republican supports the act but wants it changed to eliminate penalties for accidental bird deaths. The amendment was removed on a procedural point; however, it could be added again to the bill, which is due a Senate vote minus the amendment. Call it a fly-bye: The young peregrines have fledged at SunTrust Plaza Tower in Atlanta and northeast Georgia's Tallulah Gorge State Park ("First wild peregrine nest," May 19). Also, an adult peregrine and two fledglings were seen recently at a previous nest site in midtown Atlanta, although a nest has not been confirmed there in recent years. While the young will remain dependent on their parents for several weeks, DNR’s falcon cam is off-line for the off-season. 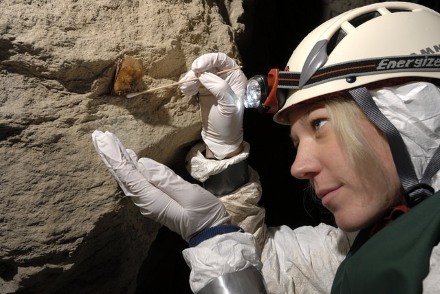 Annual nesting summary. Gov. Nathan Deal has signed a proclamation recognizing June 20 as American Eagle Day. Promoted by the American Eagle Foundation, the effort is tied to the date in 1782 when the Continental Congress adopted a design featuring a bald eagle as the new nation's official seal. The oldest banded bald eagle was found dead along a New York road June 2. Banded in August 1977 as part of an eagle restoration program, No. 03142 was 38 years old and had been a breeding male in what is now Hemlock-Canadice State Forest for some 34 years. Congrats to Georgia Outdoors, which earned a Southeast Emmy Award in the Outstanding Magazine category for Mountain Magic. The episode features Georgia's rare mountain bogs and DNR staff including botanist Dr. Mincy Moffett. The Georgia Plant Conservation Alliance capped its 20th anniversary celebration with a June 5 potluck at the State Botanical Garden of Georgia in Athens. Photos, and smiles, are posted here and here. Building solar farms on sandhill habitats has led to the relocation of more than 50 gopher tortoises to Chattahoochee Fall Line Wildlife Management Area near Columbus. The tortoises, a candidate for federal listing in the part of their range that includes Georgia, are temporarily held in acclimation pens before being released. RIP, eastern cougar. Determining that the big cat subspecies has been extinct for at least 70 years, the U.S. Fish and Wildlife Service has filed to remove eastern cougar from the endangered species list, noting that the law doesn’t protect extinct species. Any cougars seen in the East are Florida panthers (also an endangered subspecies), animals from western populations, or released or escaped cougars, the agency says. Ospreys have a new nest site in Hart County, thanks to Cpl. Craig Fulghum of DNR’s Law Enforcement Division and Hart EMC. After an osprey nest was destroyed in a logging operation, Fulghum worked to add a site nearby, with Hart EMC donating the pole and helping with installation. The Rosalynn Carter Butterfly Trail will use $130,000 from the Fish and Wildlife Service to add 100 pollinator gardens to help monarch butterflies. Part of a national effort, these "oases" of habitat on the Georgia-based trail will be designed to counter habitat loss that has decimated monarch numbers. Four Georgia state parks made this year's Top 100 Family Friendly Places to Boat and Fish in the U.S., according to the Recreational Boating & Fishing Foundation’s Take Me Fishing campaign. The fantastic four: Tugaloo on Lake Hartwell, High Falls near Jackson, Fort Yargo in Winder and Georgia Veterans in Cordele. Names in the news: Joining with hunting and shooting industry leaders at the recent National Shooting Sports Foundation Industry Summit in Savannah, DNR Wildlife Resources Division Director Dan Forster announced a memorandum of understanding that underscores a commitment to conservation and outdoors heritage between outdoor businesses and the agency. Alan Isler, formerly a Nongame Conservation Section biologist, is the new regional supervisor in southwest Georgia for the Wildlife Resources Division's Game Management Section. The Georgia Wildlife Federation has named Mike Worley as president and CEO to succeed the retiring Todd Holbrook.